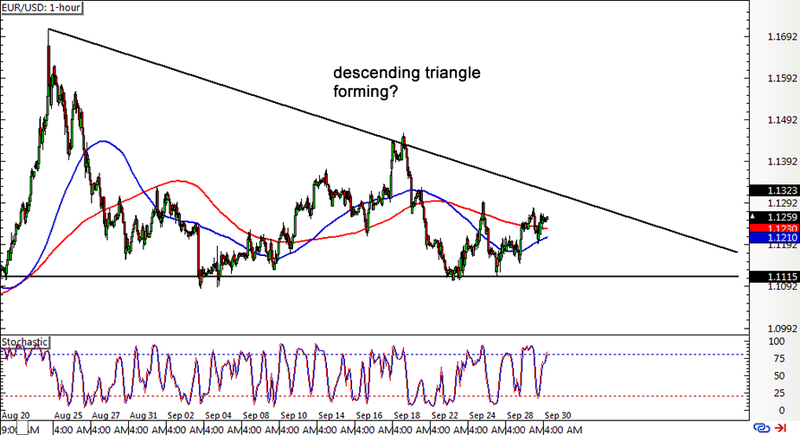 Is that a descending triangle forming on EUR/USD’s 1-hour forex time frame? The pair has formed lower highs, found support at the 1.1115 level, and is now making its way up to test the triangle resistance near the 1.1300 major psychological mark. Stochastic is on the move up, indicating that euro bulls are in control of price action and that further gains are possible. If the top of the triangle holds as resistance, price could head back to the bottom of the triangle once more. Note that the 100 SMA is below the 200 SMA, which suggests that the path of least resistance is to the downside. An upward crossover, however, could mean that buyers are gaining steam and that an upside break from the triangle is possible. If that happens, the pair could climb by around 500 pips or the same height as the chart pattern. 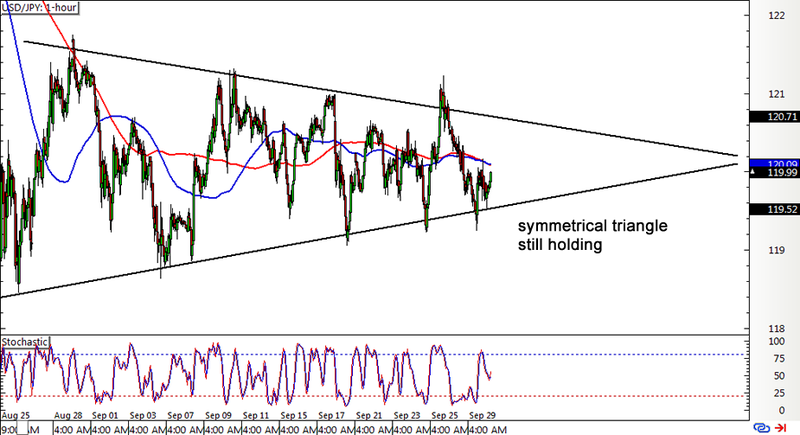 Looks like USD/JPY is still stuck inside this symmetrical triangle forex chart formation! The pair has been moving sideways inside this consolidation pattern for more than a month already and seems to be set on staying inside for now. Price just bounced off the bottom of the triangle and might be headed back towards the resistance at the 120.50 minor psychological level. However, stochastic is already on its way down, which means that selling pressure might be building up. In that case, a break below the triangle support might take place, pushing USD/JPY down by 300 pips or the same height as the triangle pattern. Better keep your eyes peeled for a long red candlestick closing below the previous lows at 119.25 if you’re hoping to short! 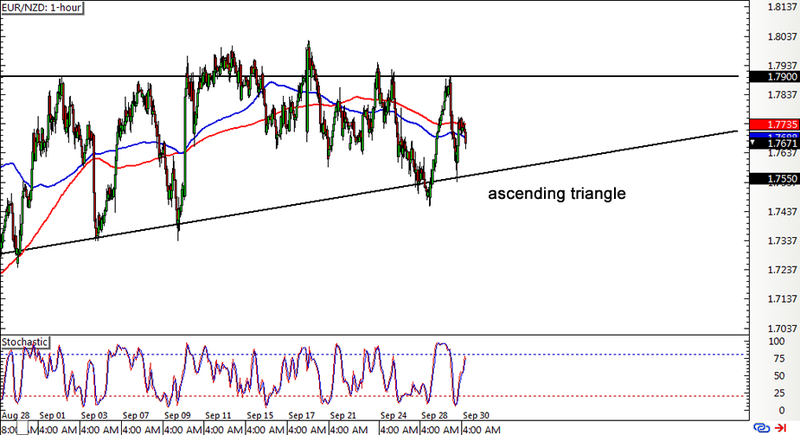 Lastly, here’s an ascending triangle formation visible on EUR/NZD’s 1-hour forex chart. Price has formed higher lows and found resistance at the 1.7900 major psychological mark, which might be tested again pretty soon. The pair just bounced off the bottom of the triangle near the 1.7600 major psychological handle and might be headed north since stochastic is climbing. However, the 100 SMA is still below the 200 SMA, which means that sellers are on top of their game and might push for a downside break. If that happens, the pair could sell off by around 600 pips, which is the same size as the chart formation. Better review our lessons on How to Trade Triangle Patterns and How to Avoid Fake Outs if you’re thinking of trading this one.